There is a range of beauty products available in the market that promises to make your skin glow, and even treat various skin problems. However, some of them may contain harmful chemicals that will do more harm than good. If you want your skin glowing and treated the natural way, try the yellow spice known as turmeric. It will do wonders for you. Turmeric can prevent the symptoms aging. It can reduce fine lines and signs of wrinkles on the face. After mixing turmeric powder, rice powder, tomato juice and milk, apply it on the face and neck and let it stay for a few minutes. Wash it off with warm water and observe your skin glow. Continue doing this and you will find that your wrinkles are less visible and your dark circles reduced as well. With turmeric, you never have to go through cosmetic surgery and undergo even the best botox treatments out there, because turmeric can do it better the natural way. Turmeric has natural healing and moisturizing properties that can even heal a cracked heel. Just mix three tablespoons of turmeric with coconut oil or castor oil, whichever is available. Apply the paste to your cracked heel and let it stay for about fifteen minutes before taking a shower. Do this procedure frequently and you will have your heel returned to its natural smooth state. Turmeric is one spice that is safe enough to use for the most troublesome skin disorders. It can be ingested or used topically to treat eczema, rashes, and skin itching. You can make different concoctions to treat these disorders. One is to put a half teaspoon of turmeric powder into boiling water for ten minutes. This can be used as a drink or used to wash the affected area. This solution has antiseptic and anti-inflammatory actions. Turmeric can remedy an itchy scalp, dandruff, and even thinning hair. Mix turmeric and olive oil together and apply on the affected scalp. Let it stay for fifteen minutes before washing it out. 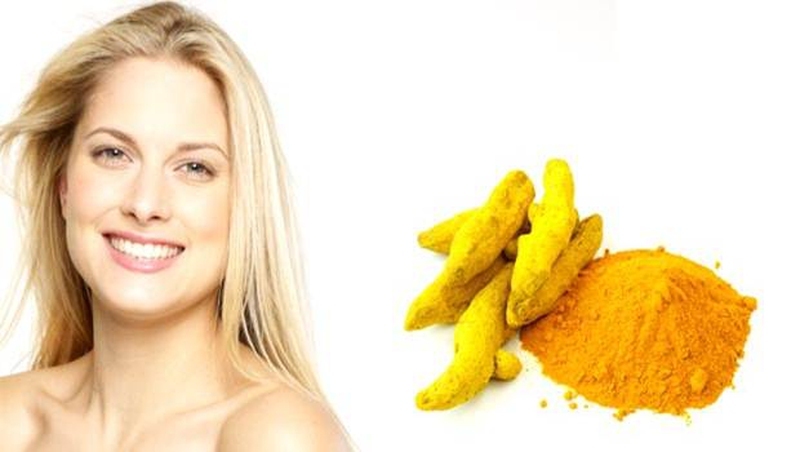 Turmeric does not only remedy your scalp problems, but it also serves as a natural hair dye to change the color of your hair or to simply brighten up your existing hair color. Just boil some turmeric, let it cool down and apply onto hair for 20 minutes before rinsing. Do it more than once to achieve the hue that you desire. Turmeric effectively cleanses and purifies the blood to give you glowing skin on the outside. Because of its antibacterial, antiseptic and anti-inflammatory properties, turmeric can treat even the most stubborn acne. Mix one teaspoon of turmeric with a tablespoon of powdered milk to form a paste. Apply it onto the face as a mask and let it stay for twenty minutes before washing it off. This is one of the best potion to make to achieve glowing and beautiful skin. Turmeric is not only used as a spice in cooking, but it is also used to treat several skin and health conditions too, such as gastrointestinal disorders, asthma, bronchitis, and even cough. So, before you resort to any prescription drugs, try something more natural first. Server responsed at: 04/18/2019 10:34 a.m.